Even as summer comes to a close and kids head back to school, heat exhaustion still poses a serious health risk to children living in warmer regions of the country. Symptoms of heat exhaustion include dizziness, fatigue, headache, nausea, vomiting, dark-colored urine, fainting, and diarrhea. Learn more about heat exhaustion below. 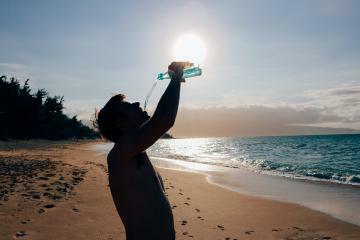 In most cases, heat exhaustion is caused by one of two things: salt depletion or water depletion. Heat exhaustion occurs as a result of your body overheating and is one of three heat-related syndromes. The other two are heat cramps (the mildest) and heat stroke (the most serious). Exposure to high temperatures — especially while engaging in strenuous activity — is the most common cause of heat-related syndromes, including heat exhaustion. If left untreated, heat exhaustion can lead to heat stroke — a potentially deadly condition that occurs when your body temperature reaches 104 degrees or higher. If you think you or your child are showing signs of heat exhaustion, get to a medical professional immediately. FastMed Urgent Care clinics stay open late and are available seven days a week. We strive to make healthcare quick, compassionate, and affordable, and we are proud to offer a Discount Program. Don’t risk heat stroke — find a FastMed Urgent Care near you today!